The DAS AMS converts text information to audio and provides audio and triggering signals on all configured channels. Digital Alert Systems (DAS) will show a new digital Audio Management System (AMS) that helps broadcasters ensure that they comply with 21st Century Communications and Video Accessibility Act (CVAA) rules and the FCC’s Message Audio mandate on both the main and SAP audio streams. The DAS AMS incorporates the new DAS Audio Message Controller (AMC) and the company’s MultiPlayer audio player and program switcher, tightly integrated in a new solution that supports message aggregation, text-to-speech (TTS) functionality, and proper message audio on both main and SAP audio streams. Bill Robertson, vice president of business development at DAS, said that by leveraging functionality from the MultiPlayer solution along with innovative software tools from the company’s DASDEC EAS systems, they now offer a powerful and economical means to aggregate emergency information and provide audio playout, switching, and signaling on multiple channels. “We've also made it simple, enabling users to manage compliance with just one system rather than using a variety of boxes,” he said. The new FCC requirements governing emergency message audio will apply to all televisions stations providing emergency information that is not part of a newscast or Emergency Alert Systems (EAS) message. Under the rules, television stations must provide audio description in the secondary audio program (SAP) channel that corresponds to any "emergency information" appearing on the main channel. Any crawls or text displays on the main channel — information such as weather alerts and school closings — that are not actual newscasts or EAS alerts must be "voiced" on the SAP channel. Broadcasters also must insert an “attention” signal or tone on the main channel to indicate that emergency audio is available on the secondary channel. Easy to configure, operate, and modify, the DAS AMS addresses all of these aspects of compliance including comprehensive logging and reporting. 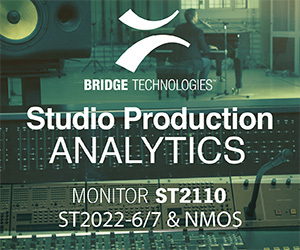 The DAS AMS aggregates information from a variety of sources, converts the text information to audio using a high-quality TTS converter, prepares it for playback on the different audio channels, and then—via a Web-based user interface—provides audio and triggering signals on all configured channels. The system supports multiple channels of AES and/or analog audio switching and playback, and it offers three playback modes: manual, automatic, and triggered playback. Because the TTS lexicon is customizable, broadcasters can adapt it to ensure accurate "pronunciation" of difficult or colloquial location names or phrases. The DAS AMS will be available at a price of $4,495, complete with one TTS voice. In the future, DAS will make additional voices available for addition to the system at a nominal cost. DAS will exhibit at NAB 2015 in booth N4816.